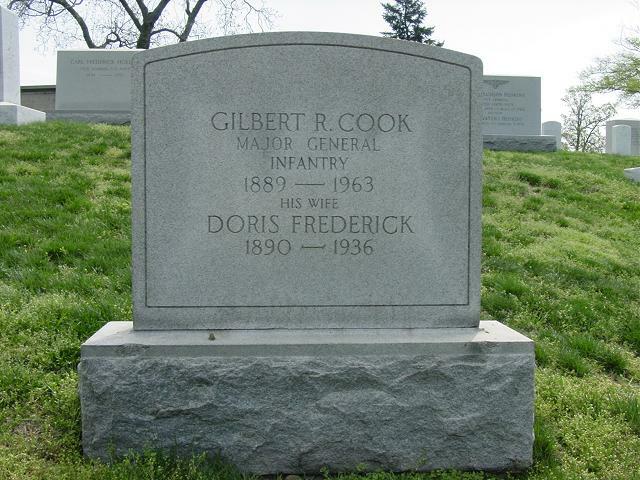 Gilbert R. Cook graduated from West Point in 1912, and his military career lasted about thirty six years. During World War II he served as commander of the 21st Infantry Regiment (1941-42), assistant division commander of the 25th Infantry Division (1942), commander of the 104th Infantry Division (1942-43), and finally as commander of XII Corps and Deputy Commander of 3rd Army (1943-44). His role as a field commander was cut short in August 1944 when he was hospitalized for illness and later returned to the states for recuperation and less strenuous duty. Documentation relating to World War II includes a sizeable quantity of personal correspondence, Cook’s 201 File, a diary, notebooks with speech, conference, and training notes, clippings, reports of operations of the XII Corps headquarters, and a report by the Pearl Harbor Review Board. Cook’s files contain correspondence with numerous military officers, including generals Patton, McNair, and Middleton, with comments on military tactics, training, and equipment. The Cook-Patton correspondence is particularly interesting, Patton comments on the Battle of the Bulge, the possible use of his tactics in the Pacific Theater, and the organization of armored and infantry divisions. The early part of Cook’s military career is not well documented. The main source here is his 201 File which starts in 1917. Besides this file, there are a few clippings and a little correspondence from this era, plus some instructional materials which he evidently used while teaching at the Infantry School at Fort Benning, Georgia (1926-1930). and training. Reports, notes, memoranda, and correspondence dealing with the above activities are found in Cook’s files. His 201 File, personal correspondence, and various printed materials help document the changes the postwar Army was undergoing and the different issues that were being discussed. Cook was called out of retirement to critique major war games in 1948 and 1955, and materials on these efforts are included in this collection. There are a number of printed or published reports or studies in this collection on a variety of military topics. Items of interest include Eisenhower’s final report as Chief of Staff (February 7, 1948), reports on the Strategic Bombing Survey, and historical studies relating to the German invasion of Russia in World War II. 1918-1919 Served as Captain, Major (temp. ), and Lieutenant Colonel (temp.) with 58th Infantry Regiment in France. 1931-1932 Attended Army War College, Washington, D. C.
1932-1936 Served in Operations and Training division, g-3, War Department General Staff, Washington, D.C.